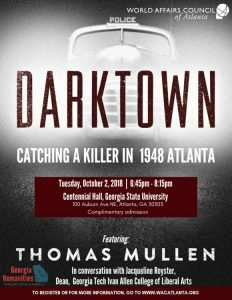 The World Affairs Council of Atlanta will host a discussion with award-winning author Thomas Mullen and Dr. Jacqueline Royster, Georgia Institute of Technology’s Dean of the Ivan Allen College of Liberal Arts, will discuss how the ripples of segregation in Atlanta shaped the rising social movements of our time, as shown in The DARKTOWN Series. A book signing will follow the discussion. For more information contact Emily Rives at 404-413-7087 or erives2@gsu.edu.